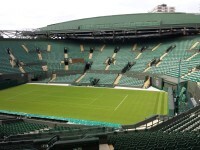 The Championships are held at The All England Lawn Tennis and Croquet Club, which is located at: The All England Lawn Tennis Club, Church Road, Wimbledon, London SW19 5AE. 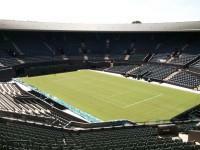 Please use SW19 5AG and SW19 5AF to locate the AELTC via Sat-Nav. All visitors are strongly advised to use public transport services wherever possible. 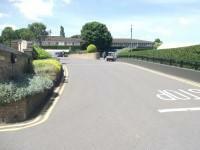 The car parks are numbers 3, 4, 5, 6, 8 and 10, they are located on Wimbledon Park Road, Church Road and Somerset Road. Blue Badge Parking is available in car parks 6 and 10. There are designated Blue Badge drop off points located on Somerset Road outside Gate 13 and on Wimbledon Park Road outside Gate 1. A Park and Ride scheme is available (06:30-23:00) at Morden Park. The park and ride stop at the Championship is located on the corner of Somerset Road and Marryat Road. For more information about Blue Badge parking in car parks 6 and 8, please click here (opens in new tab). 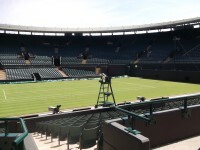 During the Championships there are dedicated bus services running from Wimbledon Station and Southfields Underground Station. The bus stop for buses from Wimbledon Station are located on Somerset Road. The bus stops for buses from Southfields Underground Station are located on Church Road. 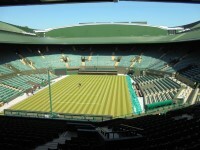 The nearest Railway Station is Wimbledon. There is a dedicated bus service from Wimbledon Station to Somerset Road. 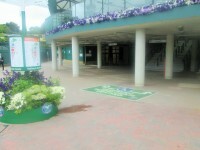 There are dedicated walking routes from the station to the Championships with clear signage. For more information on Planning Your Journey please click here (opens new tab). The nearest underground station is Wimbledon and Southfields. 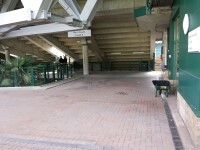 Both Wimbledon and Southfields underground stations have step free access. There are dedicated bus services from Southfields Underground Station to Church Road. 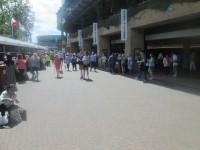 There are dedicated walking routes from both stations to the Championships with clear signage. The nearest tram stop is Wimbledon. For more information please click here (opens new tab). You are on Parking and Public Transport. Skip to the next section. For more information about parking, Championships bus stops, Blue Badge drop off points and park and ride, please click here (opens in new tab). You are on Gates and Routes to No.1 Court. Skip to the next section. 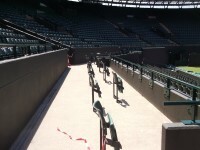 For information about Gate 5 and the route to No.1 Court please click here (opens in new tab). You are on Approach (Arbour Walk - South West Hall). Skip to the next section. There is a ramp/slope on the approach. 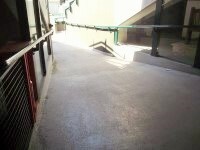 The ramp/slope is permanent, has a slight gradient. 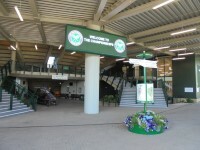 You are on Outside Access (South West Hall - Level 2). Skip to the next section. This information is for the entrance located on the corner of St Marys Walk and Arbour Walk. The width of the door opening is 600cm (19ft 8in). This entrance gives access to Level 2. There is clear signage to the wheelchair seating area. There is a very slight slope at the entrance. You are on Approach (The Canyon - North East Hall). Skip to the next section. 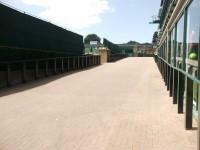 The surface of the approach is tarmac and block paving. 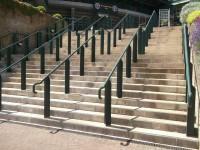 The ramp/slope is permanent, has a steep gradient. There is a/are step(s) on the approach. There is/are 10+ clearly marked step(s), with handrails on both sides. The height of the step(s) is/are 16cm. 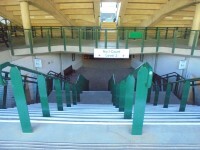 The steep slope can be overcome by using the South West Hall entrance. 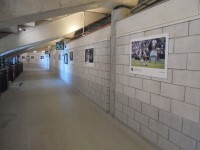 You are on Outside Access (North East Hall - Level 2). Skip to the next section. This information is for the entrance located off East Canyon Road, up a steep slope. 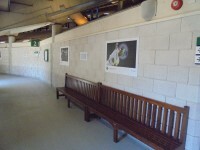 You are on Outside Access (North West Hall - Level 3). Skip to the next section. 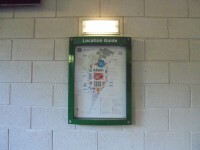 This information is for the entrance located off Aorangi Walk, at the front of the Aorangi Terrace. 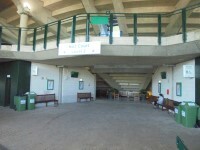 This entrance gives access to level 3 of No.1 Court. You are on Step(s) (Level 2 to Level 3). Skip to the next section. There is a/are step(s) located at the North East Hall, North West Hall and South West Hall. 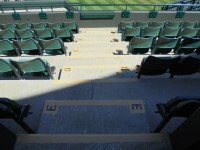 The step(s) is/are used to access The steps are used to access Level 2 and Level 3 of No.1 Court. 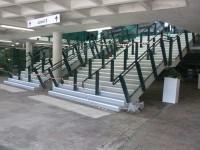 The steps can be overcome by using the paths on Arbour Walk and in front of Aorangi Terrace. The height of the step(s) is/are between 15cm and 18cm. 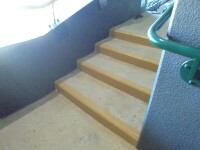 The going of the step(s) is/are between 30cm and 45cm. 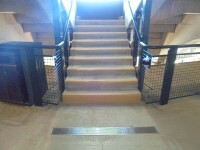 Some of the sets of steps have handrail which extend horizontally beyond the first and last steps to aid visually impaired people. 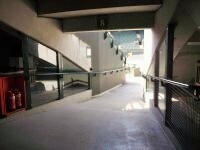 You are on Level 2 and Level 3 Concourse. Skip to the next section. 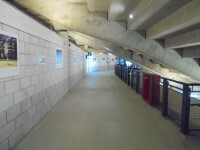 There is step free access along the both Level 2 and Level 3. 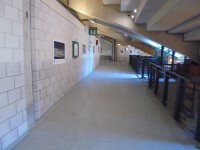 There are some slight slopes located along the Level 2 Concourse. The surface of the flooring is concrete. 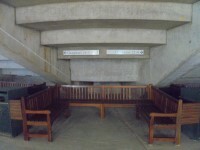 There is bench seating available on both levels at regular intervals. 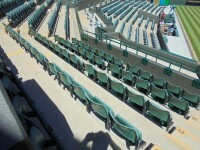 There is clear signage on both levels to the seating. 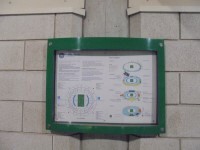 There are maps of the grounds and of No.1 Court. 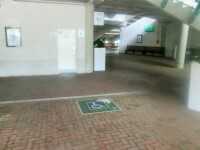 There are designated wheelchair spaces located on Level 2. 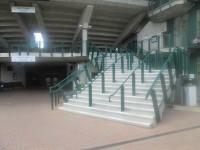 There are between 8 to 12 steps with handrails leading out from the concourse gangways to the seating area. 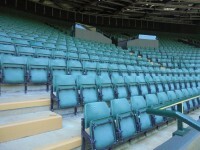 Once out onto the seating area there 1 to 15 plus steps to the seats. You are on Designated Wheelchair Seating Area - Level 2. Skip to the next section. 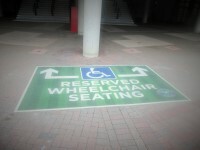 Wheelchair users have a designated seating area. 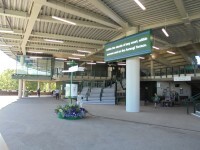 The designated accessible seating area is accessed from the concourse through gangways 8 - 12 located closest to the South West Hall Entrance and gangways 26 - 30 located closest to the North East Hall Entrance. 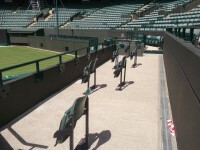 There are slight slopes leading to the designated seating through the gangways. 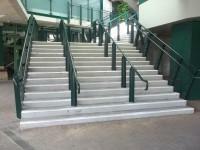 They have handrails on both sides. 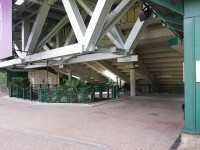 The gangways are 1.4m wide at the narrowest point. The view from this area is good. A companion can sit near / beside you. 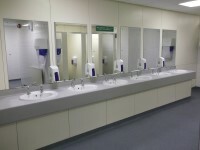 The accessible toilets are located at the nearest entrance hall. You are on Accessible Toilet(s) (No.1 Court - The Canyon). Skip to the next section. The accessible toilet surveyed is for the sole use of disabled people. This accessible toilet is located just off The Canyon path. 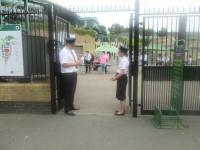 The key can be obtained from the security officer on entry to the grounds. The width of the accessible toilet door is 85cm (2ft 9in). The dimensions of the accessible toilet are 135cm x 195cm (4ft 5in x 6ft 5in). The height of the coat hook is 110cm from the floor. The toilet has a backrest. The height of the soap dispenser is 85cm. The height of the towel dispenser is 120cm (3ft 11in). You are on Accessible Toilet(s) (No.1 Court - Level 2 - North East Hall Male). Skip to the next section. This accessible toilet is located in No.1 Court on level 2 in the North East Hall. There is step free access to the accessible toilet. The dimensions of the accessible toilet are 150cm x 200cm (4ft 11in x 6ft 7in). 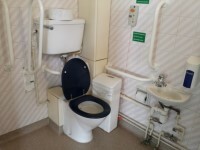 The accessible toilet does have an unobstructed minimum turning space of 150cm x 150cm in front of the seat. The toilet has a non slip floor. The lateral transfer space is 83cm (2ft 9in). The height of the coat hook is 115cm from the floor. You are on Accessible Toilet(s) (No.1 Court - Level 2 - North East Hall Female). Skip to the next section. 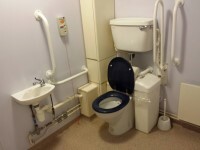 The dimensions of the accessible toilet are 170cm x 195cm (5ft 7in x 6ft 5in). 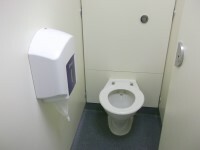 The accessible toilet does not have an unobstructed minimum turning space of 150cm x 150cm in front of the seat. The toilet does not have a backrest or a cistern. There is not a toilet roll holder. You are on Accessible Toilet(s) (No.1 Court - Level 2 - South West Hall Male). Skip to the next section. 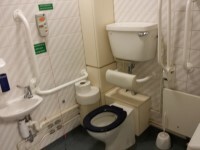 This accessible toilet is located in No.1 Court on level 2 to the left of the South West Hall. 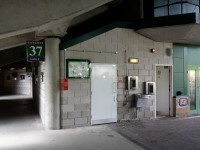 There is a similar accessible toilet on level 2 located opposite gangways 14 and 16, and opposite gangways 32 and 34 but with transfer space on the right. You are on Accessible Toilet(s) (No.1 Court - Level 2 - South West Hall Female). Skip to the next section. This accessible toilet is located in No.1 Court on level 2, to the left of the South West Hall. 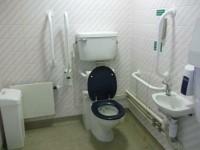 The dimensions of the accessible toilet are 170cm x 200cm (5ft 7in x 6ft 7in). The mirror is placed at a lower level or at an angle for ease of use. 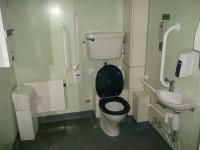 There is a similar accessible toilet on level 2 located opposite gangways 14 and 16 but with transfer space on the left. You are on Accessible Toilet(s) (No.1 Court - Level 2 Gangway 32/34). Skip to the next section. This accessible toilet is located in No.1 Court on level 2 opposite Gangways 32 and 34. 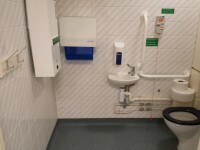 The dimensions of the accessible toilet are 170cm x 270cm (5ft 7in x 8ft 10in). 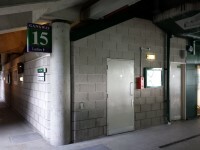 You are on Accessible Toilet(s) (No.1 Court - Level 3 Gangway 15). Skip to the next section. This accessible toilet is located in No.1 Court on level 3 opposite Gangway 15. 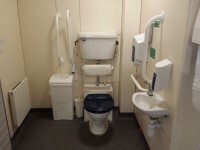 The dimensions of the accessible toilet are 165cm x 215cm (5ft 5in x 7ft 1in). There is a similar accessible toilet located on level 3 opposite Gangway 25. You are on Accessible Toilet(s) (No.1 Court - Level 3 Gangway 37). Skip to the next section. This accessible toilet is located in No.1 Court on level 3 opposite Gangway 37. 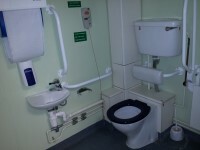 The dimensions of the accessible toilet are 150cm x 215cm (4ft 11in x 7ft 1in). There are similar accessible toilets located on level 3 opposite gangways 3, 7, 27 and 41. The female and male toilet facilities that were surveyed are located to the left and right of each hall entrance. 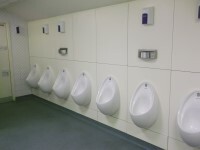 The female and male toilets are approximately 20m (21yd 2ft) from the hall entrance. 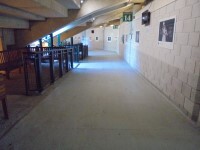 Standard toilets are located at each hall entrance into No.1 Court. 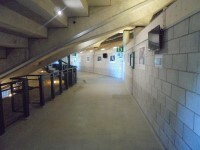 There are additional standard toilets located on level 3 at the top of each staircase from hall entrances.